When Sandra Garza graduated from Coyne College in 1996, she was the only woman in her HVAC program. She was accepted with open arms and took advantage of all the training and mentoring she could get. It paid off. Now, 22 years later, she is the owner of SG Heating & Cooling Services in Oak Lawn. The path she took toward business ownership was a strategic one. After graduation, Coyne immediately placed Garza in her first job. “It was more plumbing than I expected,” she said, “and I’m not a plumber.” She spent a year in the position but asked Coyne for more job placement assistance. In each subsequent position, she learned more and more about the industry as she honed her skills. “I started my sole proprietorship 15 years ago,” Garza says, even as she continued to work with other companies. “I got a lot of experience with companies, but that expanded to appliances.” Work was steady until about eight years ago. “The HVAC industry took a dip,” she remembers. “I think the weather had a lot to do with it.” Chicago in 2010 saw a fairly temperate climate, and the demands for heating and air conditioning dwindled. It was difficult to get steady work. Garza thought carefully about the next steps needed to keep herself afloat, and she decided to open her own business operated out of her home. “My plan was to go into the warranty industry,” she says. “I already knew appliances and was able to make that leap.” Having learned something from each place she had worked, she was confident she could make a go of it. Last year, Garza opened a storefront office in Oak Lawn at 5913 W. 87th Street. “In a period of one year, I tripled my business,” she says. 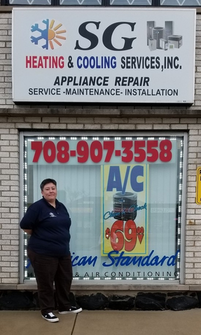 “I couldn’t handle it all on my own.” She hired two secretaries and four HVAC technicians who help her in her business, which focuses on third-party appliance warranties – a field that she says is really expanding. None of it would have been possible without the education Garza received at Coyne College. “The hands-on training was a plus,” she says, “and the teachers were really good.” At the time she was in school, her dad owned a restaurant in Gary, Indiana. “He had lots of coolers and often needed help.” Garza said she would help the refrigeration guy. She would then go back to school and talk about the problems they had doing the restaurant work, and they’d do troubleshooting in class. The combination of working in the field and discussing her real-life work issues helped tie everything together. If you like working with your hands, have a mechanical aptitude and are looking for an in-demand career, consider becoming a heating, air conditioning and refrigeration technician. The job market for HVAC technicians is very good right now. According to O*NET Online, the projected growth of HVAC jobs through 2026 is much higher than average. Coyne College prepares you for a career in HVAC-R in less than a year. You’ll learn real-world skills, get hands-on training and receive individual attention from instructors who are industry professionals. Contact Coyne College for more information or to register for classes.